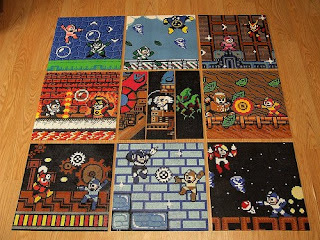 Redherring of Craftster.org crafted these magnificent Mega Man 2 scenes entirely out of perler beads. The project consisted of over 60,000 individual beads and six months of work. Impressive, to say the least. You can check out a couple more images of the project at this topic here. I'd love it if someone made one of those for Mega Man 3, which in my opinion, is superior to Mega Man 2 in almost every way. But still, though. This isn't bad.